Welcome to the Million Dollar Journey June 2017 Financial Freedom Update – the second update of the year. For those of you new here, since achieving $1M in net worth in June 2014 (age 35), I have shifted my focus to achieving financial independence. How? I plan on building my passive income sources to the point where they are enough to cover our family expenses. All within the next 5 3.5 years. If you would like to follow my latest financial journey, you can get my updates sent directly to your email, via Twitter (where I have been more active lately) and/or you can sign up for the monthly Million Dollar Journey Newsletter. Our current annual recurring expenses are in the $50-$52k range, but that’s without vacation costs. However, while travel is important to us, it is something that we consider discretionary (and frankly, a luxury). If money became tight, we could cut vacation for the year. In light of this, our ultimate goal for passive income to be have enough to cover recurring expenses, and for business (or other active) income to cover luxuries such as travel, savings for a new/used car, and simply extra cash flow. Reaching this goal would mean that my family could live comfortably without relying on full time salaries. I would have the choice to leave full time work and allow me to focus my efforts on other interests, hobbies, and entrepeneurial pursuits. To give you context for this update, here are the numbers in my previous financial freedom update. Since March, there has been little change to our financial situation. In fact, it has been more go-with-the-flow type mentality. We still live off my government salary, and we still pay close attention to our spending (here is a breakdown of our expenses in 2015 ). Since we do not have any large debt servicing requirements (mortgage, rent, car payments etc), my salary allows us to live comfortably, but far from extravagantly. In a previous update, I mentioned that there was some financial benefit to my spouse leaving her position, namely her pensions. One pension was already transferred to a LIRA with Questrade, but there was a larger pension to deal with. We had the option of leaving the pension in place until the age of 60, or taking the inflated commuted value (due to the low-interest-rate environment) lump sum and investing it ourselves. I’m happy to say that the commuted value was again transferred to Questrade and waiting to be invested. I must admit that although the plan is to index the portfolio, I’m a little uncomfortable investing going all-in at all-time market highs. Perhaps I will invest smaller amounts over a period of time and take advantage of dollar cost averaging. Now, let’s talk a bit about my passive income strategy – generating dividend income. As dividends are the main focus of my passive income pursuit, there is a large dependence on the market. While there are merits to this investment strategy, there are also substantial risks – particularly dividend cuts. As an example, you may have heard about what happened to Home Capital Group (HCG). This is a secondary lender who had a very strong track record of dividend increases (18 years in a row). HCG funded their mortgages through client deposits into GICs and high-interest savings accounts. With the company under investigation, client essentially made a run at the bank and essentially wiped out HCG’s high-interest savings balance. To help stop the bleeding, HCG obtained a very expensive line of credit. The deal was so expensive that it could end up wiping out a full year of earnings. In light of this, the company suspended their dividends in May. 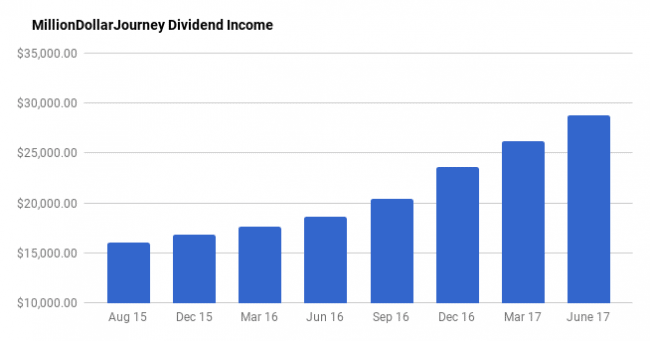 In addition to the dividend raises, I’ve continued to deploy corporate cash into dividend stocks which has resulted in the biggest contributor to dividend income growth ($9,700 annually -> $11,700 annually). Since this is currently my largest investment account, it also adds the most weight to my overall holdings. Through a combination of deploying cash and collecting those juicy dividend increases, the midway mark for 2017 has been strong with a 9.73% bump in dividend income. With the financial goal of $35,000/year by the end of this year, I will need to stay aggressive in deploying savings capital into yielding positions. We still have a long way to go, but for the most part, we are moving in the right direction. There is cash available to deploy in most of our accounts – in particular, the lump sum of cash from the commuted values of the pensions. That’s in addition to the dividends that are constantly being churned out which gets deposited as cash and reinvested again (the power of compounding). Let me know if you have any questions by leaving a comment. On top of the dividend income strategy, would you consider adding another strategy to increase you passive income like writing covered call options? Also if you want to buy any stock cheaper, would you consider writing naked put options that are out of the money? You get to keep the premium if the stock doesn’t drop down to the strike price. I personally use these two strategies on top of my dividend income portfolio to improve my returns and increase my income. Thanks for the suggestion Leo. I’ve tried covered calls before, but I found it to be a fairly active strategy of watching if the position gets called away. Do you have a particular strategy for writing covered calls? Hey FT, I usually like to sell covered calls that are one year in length or so and the price of the stock is at a 52 weeks high of all time high. The strike price is even higher than the current price and it’s out of the money. If my call option is exercised, I will make a least a 15% return on top of the current gain. This is a combination of dividend + options premium + capital gain. For example, a few months ago, I bought Chipotle Mexican Grill (CMG) at $430 per share and sold one covered call options contract expiring on January 2018 with strike price of $600 per share and collected $1600 in premium. If my options is exercised within a year or so, I am more than happy to sell at $600 per share. If not, I get to keep the $1600 for free. Writing covered call is a great way to make free money on the stocks you already own. I only write options and don’t buy any. I let others do the speculation and I make money regardless if the options that I write will be exercised or not at the expiry date. Thanks for the explanation Leo. Statistically, how often do your positions get called away? Thanks Leo. Selling puts is an idea for positions that I want to add to during the year. In a recent study Vanguard stated that lump-sum investing achieves better return than dollar-cost averaging. I still invest regular amount from each pay check (so doing dollar-cost averaging) , but it seems that if you have the money now, you are better to invest it now. Emotions are the biggest challenge in investing ;-) If I had a penny for the amount of times I heard of this “extended bull market” I’d be rich! Seeing as your strategy is to pick individual “horses” I do share your concern but picking tops is a loser’s game IMHO. Great update, keep up the good investing. No doubt Max, emotions can sometimes (or most of the time) overtake logic! I’m doing my best to deploy as much cash as possible, but all-in at one-time would be a tough one! I am very eager to watch your corporate holdings account. I have 3 small business and have just started to grow the holdco non registered account. Are you investing all of your corp income into the stock market? Are they corporate class shares? Are the MER ypically higher on corporate class shares? I would love for you to do a post on the advantages of using the corporate holding account to invest. Have you deployed any life insurance policies in your corporate account. I know there are a lot of business owners reading your blog who would feel the same. If you have already and could provide a link to it that would be great. For me, I want to generate enough passive income to have the ability to retire early (I’ll likely always work in some capacity). The dividend income strategy works well for these purposes. I do not have any life insurance policies within the business. I had a cibc branch advisor initally. The retained earning were liquidated for the last business (pet food store). Holdco. Holdco ownes the loan for petco. Also owns a share of the local after hour vet clinic, all investments and life insurance. Now that the pet store is breaking even i am ready to deploy retained earnings into the holdco. A lot of accounting and legal fees to purify the vetco earnings into the holdco. This helps with future sale price and capital gains exemptions. The holdco holds a last to die participating whole life policy for my wife and I. Holco overpays life insurance 6k annually with an addition payment rider. I think this plan was stopped by a federal budget but existing polices are grandfathered. My plan is to deploy $75k this month and the 10k monthly. I have 350k left on my mortgage and typically overpay 50k year. Kids RESP plans are maxed within the goverment credit strategy. RRSP are not utilized by me. I think my income in retirement will be higher than when working. My wife owns 100÷ of the pet store. I own 100÷ of the vetco and holdco. On ontario only vets can own veterinary clinics. My wife has a DB pension with the feds. And is still working the government. Kevin, sounds like you guys are doing great financially. The only problem is that you may have too much money in retirement, which is always a nice problem to have! Impressive work as always and very well done. Curious FT, and you may have mentioned it before, what % of cash do you keep on the sidelines if you will, beyond an emergency fund? I can appreciate the desire to limp-in if you will with your capital when markets are where they are. I’m struggling with investing right now so maybe I will continue to save money, hence my question to you. We keep $10K as our emergency fund FWIW although I suspect you have a larger cash buffer! Hi Mark, sorry just seeing this comment. I don’t have a specific formula as to how much I keep in cash. I just keep deploying savings as I see fit. As you can see though, I should be deploying faster rather than keeping cash on the sidelines. Hello FT. I have read quite a bit of your posts and appreciate the work you do. Do you have a post explaining your corporate account and what it is, how you set it up and reason for having a corporate account? As someone lucky enough to (eventually) have a govt DB pension I’m curious about you withdrawing your wife’s pension. Specifically the math or process you used to decide that you would be better off investing yourself. I assume you would compare how much your wife would be entitled to monthly over a typical lifespan to how much you could expect to earn by investing the commuted value and making small withdrawals over the same lifespan. I’m curious how close the numbers were, how well your investments need to perform to be better off than taking the monthly pension. Also how you planned for longevity and the possibility of dying young and losing out on future pension payments vs the risk of withdrawing and out living your money. I’ve always assumed that leaving the money in the pension plan would be beneficial since market risk is spread over all plan members and your benefits are guaranteed. That said I’ve never run the numbers to actually see how well I would need to invest to match my eventual pension income. Hi Russ! Thanks for the comment, you just gave me an idea for another post. Stay tuned.